The city of Qingdao, China’s Shandong Province, hosted an exhibition-fair of products imported to China from the countries represented in the Shanghai Cooperation Organization (SCO). Various products were put up for sale in member countries, as well as countries that have status of observer and a dialogue partner for the organization. The national stand, prepared by the Embassy of Azerbaijan, which is represented in the Shanghai Cooperation Organization as a dialogue partner, demonstrated the competitive export products produced in the country. 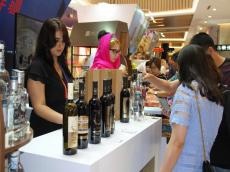 Producers put on display mainly wine and alcoholic beverages, which attracted great interest of residents of Qingdao. Moreover, they held a presentation dedicated to the tourism potential of Azerbaijan, the development of this sector in the country, the activities of tourist centers operating in Baku and regions that meet modern standards. The presentation provided video-features about the tourism potential of Azerbaijan, the nomination of Baku for the World Expo-2025 exhibition, and the events of international importance organized in Azerbaijan. During the three days of the exhibition, these videos were constantly shown on a wide screen. The video-features about the exhibition-fair, prepared by the Chinese mass media, outlined Azerbaijan’s activity at the event and the country’s activities as a whole. Trade and economic contacts occupy a significant place in bilateral relations between China and Azerbaijan. The process of interaction between the two countries was marked by constant tendencies of expansion and strengthening of cooperation. The Great Silk Road is a general name of a caravan road, which has been the main two-way trading bridge of East and West since the 3rd century BC up to now. The Great Silk Road starts in Japan and China stretches up to Europe cutting through India, Afghanistan, Iran, Central Asia, Caucasus, Asia Minor, Northern Africa including connecting Indian Ocean, Chinese sea, Japanese sea, Red sea, Caspian sea, Black sea, Azov sea and Mediterranean sea.